I know he's a long shot for the papacy. I get it. He has more baggage than an airport. But that doesn't detract from his excellent qualities. Qualities that are very badly needed in this Church. I want to give you another sample of Cardinal Pell's style, so that you too can appreciate him as a potential candidate. One things you will notice about Cardinal Pell is that he is not afraid to give interviews. And when the interviewer asks him a question, he (usually) answers the question directly in a language that the common person can understand. In plain Engilsh: he talks normal. "But his record on life issues is very bad, indeed." Then later he says "I wish him well because a lot rides on his decisions, but he has a very slight Curriculum Vitae to be president of the United States.[...] We've yet to see him really do anything that has significantly changed the situation for the better. But it's very early days..."
What is so shocking about these statements is the way he openly criticizes an individual by name-- which is not typically done by bishops of any rank-- and he says what many people are thinking. Bishops are typically diplomatic. Their speech is wooden, and if they do criticize, it is indirectly. In other words, they speak like politicians. In April of the same year, he gave an interview with Sky News. The interviewer said that Tony Blair had criticized the pope for his "entrenched views on homosexuality. "I think Blair is an absolute mystery. I mean with Blair's record on life issues and understanding of sexuality... for him to come into the Catholic Church with a whole set of attitudes that are at variance with Catholic teaching-- you wonder about the level of instruction he received. I'm not doubting his faith but he has a very imperfect understanding of traditional Christian morality." Again, shocking words. You don't criticize a world leader (albeit a former one). And you don't criticize the instruction he received! When Cardinal Pell made that comment, my jaw dropped. I think that must've stung the prelate who let Tony Blair into the Church. But it's about time we had that! I want that kind of titanium spine in my pope. This message is filmed in his office. Have you ever seen the office of a cardinal? It's a mess. It has a laptop on there. Cardinal Pell looks very comfortable speaking about the internet. You suspect he might even use it, comfortably. Contrast that with Pope Benedict XVI, who understood that it was important, but really had to be goaded to use it. He has a twitter account that is eagerly read, but he tweets so infrequently, you get the feeling it's a chore for him, not something he really wants to do. Cardinal Pell does not have a Twitter account as far as I know. But you get the impression he could do it if he had to. He is so opinionated and ready to give his opinion that twitter would be a snap. Popes John Paul II and Benedict XVI were academics. Cardinal Pell is not. He's more of a hands-on type of bishop. Maybe it's time we consider someone like him. And lastly, I'd like to point to Cardinal Pell's reaction to an appeal made to Rome by a bunch of dissidents. Their claim? Cardinal Pell wasn't teaching orthodox doctrine. The idea of some of Australia's more notorious public dissenters appealing to Rome's doctrinal watchdog over Cardinal Pell's orthodoxy might seem to be in the realm of fantasy. Yet on 20 February 2006, reports appeared in the Melbourne Age and Sydney Morning Herald of a complaint by "a group of leading liberal Catholics" to the Vatican "that Cardinal George Pell is teaching inaccurate and misleading doctrine." The complaint concerned Cardinal Pell's presentations of the Church's position on conscience. Cardinal Pell's response was typically direct: "This is a real hoot - such well-known defenders of orthodoxy as Paul Collins, Veronica Brady and Max Charlesworth appealing to the Congregation for the Doctrine of the Faith. "What is in dispute is not the importance of conscience, but whether conscience must be oriented to truth, to the word of God. Truth is supreme and as the encyclical Veritatis Splendor said, conscience is the proximate norm. If an individual's personal conscience is supreme my conscientious viewpoint is as good as the view of this crew, and there is no way of resolving the dispute between us. "There has never been a traditional Catholic teaching of the primacy of conscience. This was one of the great issues at the Reformation and the word of God remains supreme no matter how uncomfortable this is for the loyal opposition, for Catholic dissenters. A watch or clock is always useful especially when it is telling the correct time." 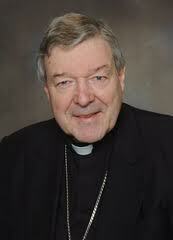 By the way, George Pell's doctorate is in Church History (from Oxford! ), not Theology, Canon Law or Philosophy. This could be considered a strike against him. But, as in real life, your diploma doesn't matter. It's whether you're able to get the job done. By writing this pope, I don't wish to denigrate any potential candidate for the papacy. I'm sure whoever is elected will be good, but I really think Cardinal Pell has the necessary qualities in this day and age.